Hey! Are y’all ready for the biggest ever pumpkin party on the internet?! 70+ bloggers are coming together today to share amazing recipes made with fall’s favorite fruit! Pretty much all the pumpkin dishes you could imagine are here – everything from pumpkin pancakes, to cookies, cake, milkshakes, soup, bagels, polenta, dog treats and more… waaaay more. It’s insane and kinda reminds me of this. 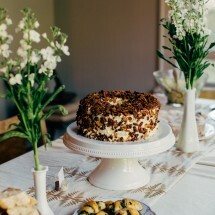 Make sure to check-out the entire list of recipes at the bottom of this post! And follow along on social media with #virtualpumpkinparty. This ‘ravioli’ was my attempt at a little trick or treat bit. Or some of you may think of it as a cruel joke, like when you got one of those little boxes of raisins in your halloween bag, ugh, I hated that. But after a week of bingeing on office halloween candy (which I totally blame my parents for – they rationed that stuff so hard when we were kids) I was craving something bright, clean and fresh. Yeah, I’m pretty sure this tastes like something you would eat at one of those holistic wellness spa resort thingys (which I’m secretly intrigued about). 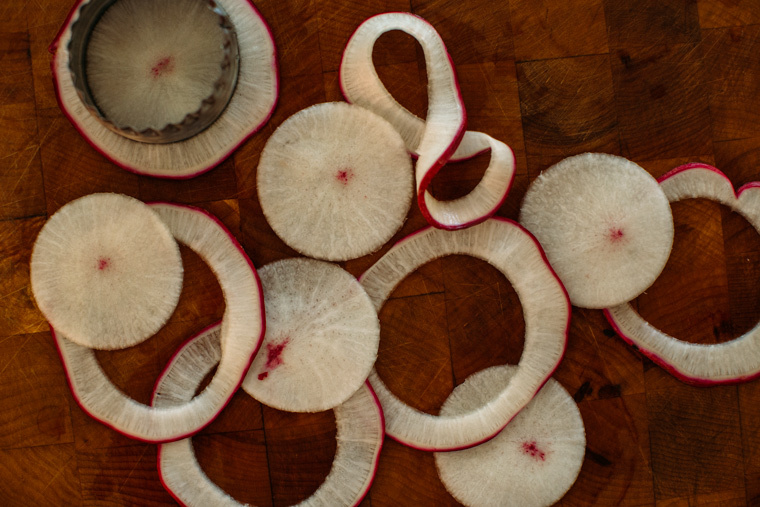 The turnips get sliced super thin then blanched so they get all floppy like little noodles. The pumpkin filling tastes surprisingly rich and flavorful, thanks to a heavy dose of cashew creme (that stuff is pure magic and so easy to make!). 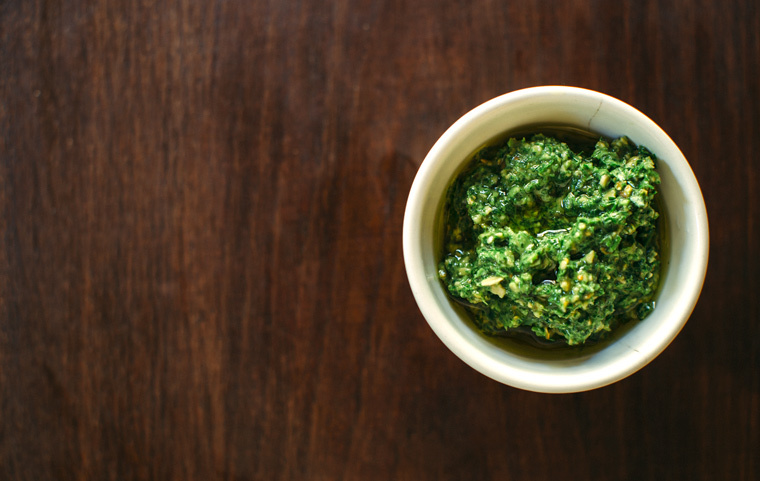 And I’ve already made this pumpkin seed pesto twice since making it for this post – it’s the only way I want to eat my pesto for the foreseeable future. 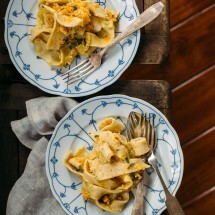 Of course if you don’t want to make noodles out of vegetables – which I totally get (both from a labor and taste perspective), you could just toss your favorite pasta with this pumpkin alfredo-y sauce – same goes for the pepita pesto for that matter. So many options, so much deliciousness, not enough days left in the season to eat all this goodness! Happy pumpkin party day my friends! AND a big thanks to Sara for hosting this amazing celebration! Melt the ‘butter’ in a pan over medium heat. Add the garlic and lightly toast / sauté until fragrant. 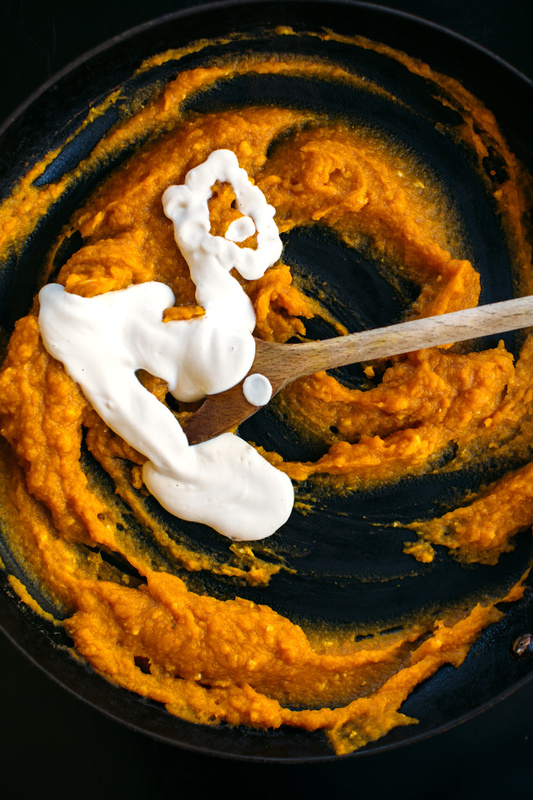 Add the rest of the ingredients (except the cashew cream) and cook the moisture out so that pumpkin puree really thickens up (about 6 to 8 minutes). Add the cashew cream and stir well to combine. Soak the cashews overnight. Just blend with a bit of water the next day to make the cream. Start with 2 tablespoons and work your way up to your desired sauciness. I like mine pretty thick. 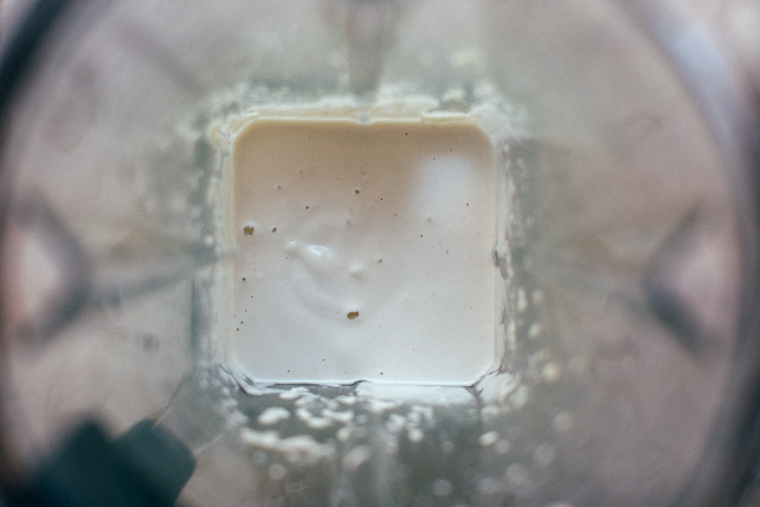 Leftover cream can be used in a smoothie, with granola or as a pancake topping. yum! 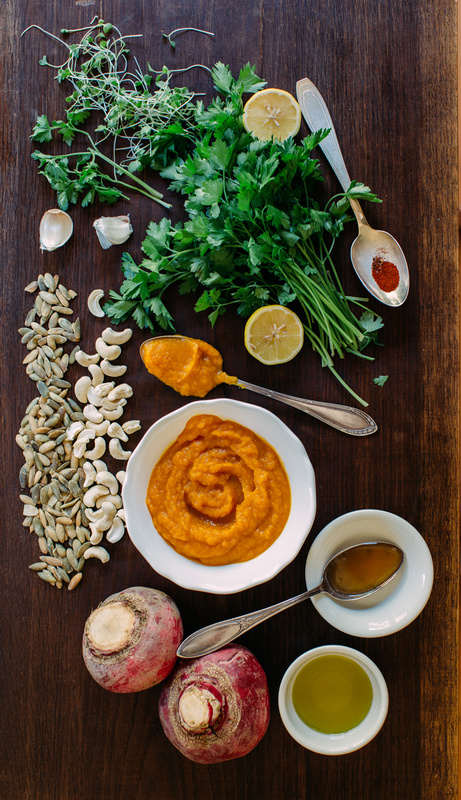 Blend all the ingredients together in a food processor. Salt to taste. Easy! 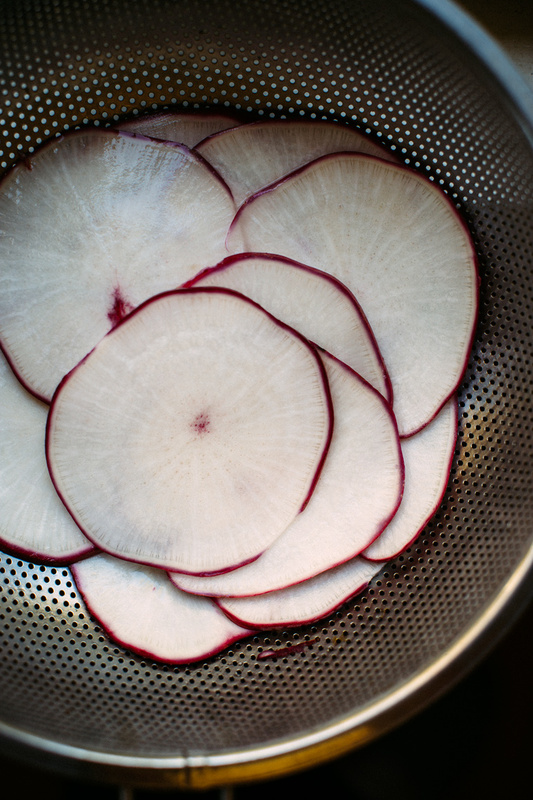 Slice the turnip super thin on a mandolin. Cut the slices into small circles using a little cookie cutter. Blanch the slices so they get all floppy like little noodles. Add a tablespoon of pumpkin filling in the center of each ‘noodle’, brush a little olive oil around the outer rim and press to seal. 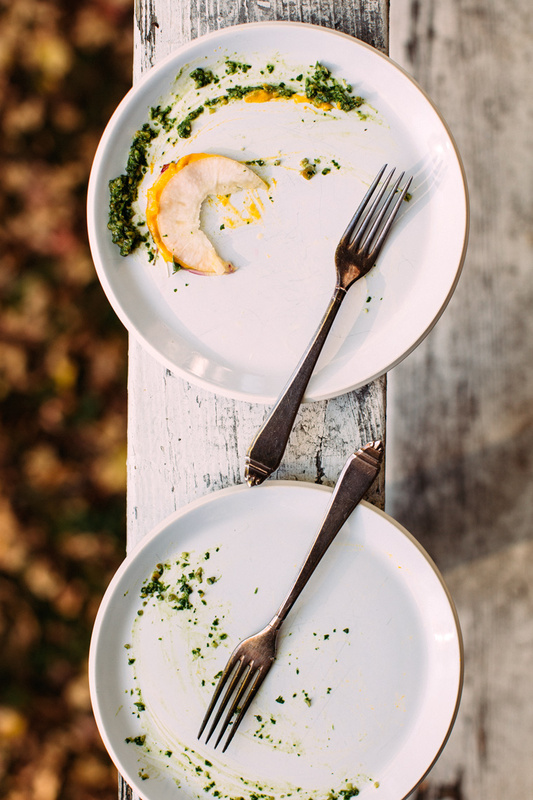 Serve with pesto and microgreens. Inspired by a recipe in this book. Gorgeous ravioli girl! This is totally random, but growing up my Grandpa always said that turnips put hair on your chest…I didn’t end up trying them until I was in my 20s!! lol Now I love them! Duuude, this is one of the most creative posts for the pumpkin partay! Using turnip slices as ravioli is just.. woah. 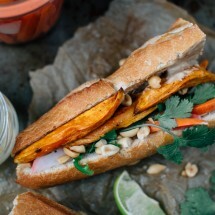 This looks seriously delish! You are hilarious – and so creative! I had to totally do a double take when I saw this post. Genius spa-vibes here Grace and I’m loving it. I just ate two candy bars (albeit they were homemade) and am still game for more.. 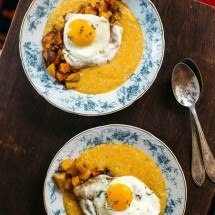 But I’m sure in a few days I’ll be craving a dish such as this beauty (!!!) just like you were. What a potluck today was! SO FUN. Omg these are SO adorable!! I love the tender pink and white hues of turnip against the bright vibrance of the pumpkin. And that cashew alfredo?! YES PLEASE! Swoon. Wow! This is so inventive. I love the idea of using turnips for the ravioli shells. Mind blown! I love seeing what everyone created for this pumpkin party! Haha! I hated seeing raisin boxes in my Halloween bag too! Such a deception! Who would ever buy raisins as Halloween “candies” anyways…?! They’re not even a candy! This recipe is so creative Grace! Love it. 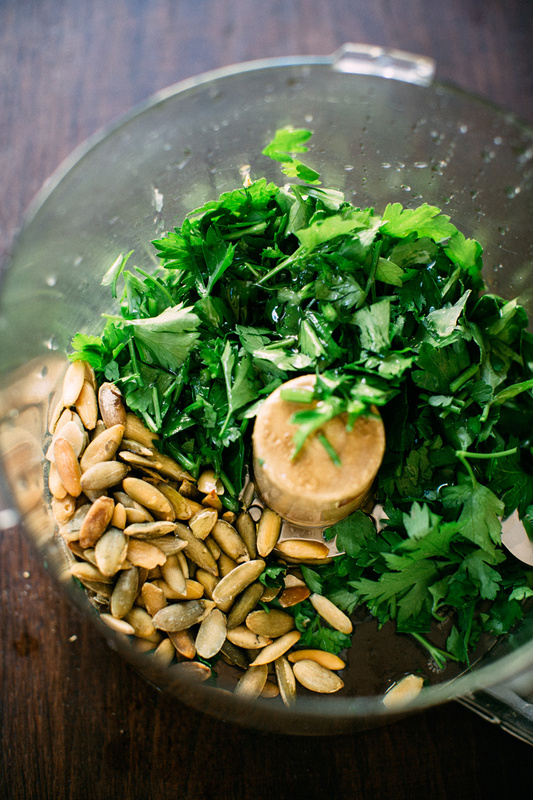 And this pumpkin seed pesto sounds really amazing!! This virtual party was so much fun. Still making my way through all the recipes. This is one gorgeous plate of food! 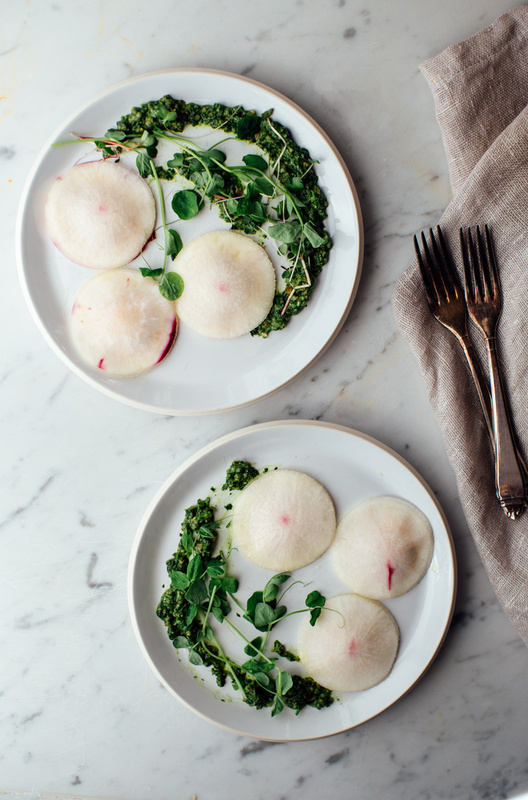 And I love the idea of using shaved turnip in lieu of pasta dough. Wow what a lovely plate, my friend! 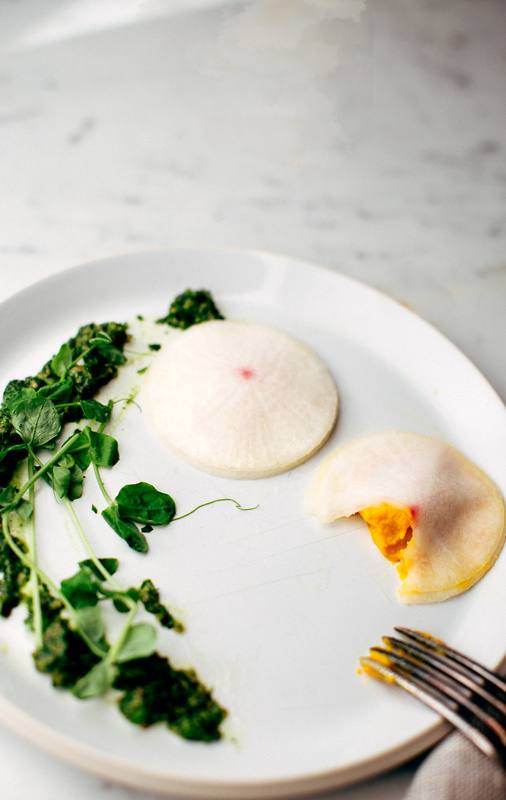 I love the idea of using turnips for the ravioli shells. This is so clever! And this pumpkin party is awesome!! 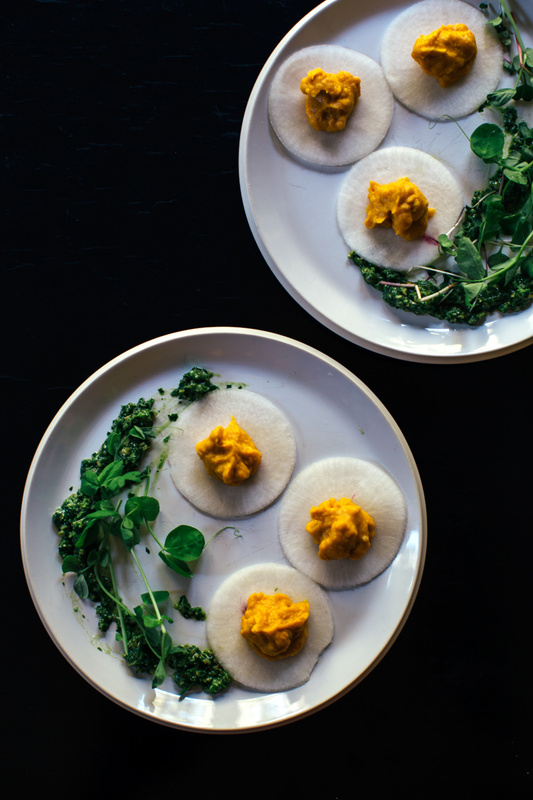 This pumpkin ravioli dish is absolutely gorgeous and much easier to execute that I originally thought. 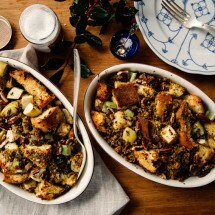 Love the pepita pesto pairing and the use of turnips for ravioli! 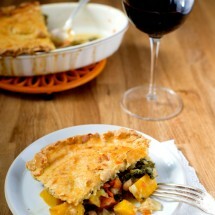 I love all the ingredients you use here and how you’ve combined them- and they look almost too pretty to eat! Thanks for sharing this beautiful dish.